The only other undine with Aria Company, Alicia is one of the Three Water Fairies of Neo-Venezia, known by the title "Snow White". 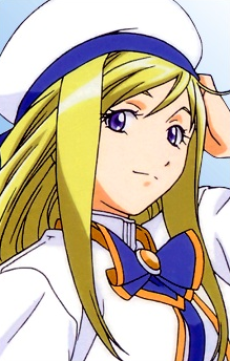 At the start of the series, she is 19 years old and the most popular undine in the city, noted especially for her graceful rowing style. She was promoted to Prima at 15, the youngest ever to do so. Like Akari, she is relaxed and easy-going, but she also likes to tease others, especially her childhood friend Akira. Her favorite phrase is ara ara and she frequently giggles, to Akira's annoyance. According to Grandma Akino, she is an excellent undine because of her ability to enjoy everything. At the end of the series, Alicia announces her upcoming marriage (though to whom is never stated) and retirement to take an administrative position with the Gondola Association. She tells Akari she had put off her Prima exam because she had been planning to retire after that, and did not want to leave her student and friend. According to issue number 6 of Monthly Undine, after her retirement, "Snow White" is designated the 8th "honored appellation" by the Gondola Association, as an undine who made great contributions to the industry.